5%+ PRICE REDUCTION TODAY ~ NOW $284,900 ~ MAKE YOUR OFFER NOW for MILES of AMAZING RIVER VIEWS! This corner, end unit has vast water views for miles! NOW REDUCED to $284,900 for these AMAZING RIVER VIEWS FROM the LIVING ROOM, KITCHEN, MASTER BEDROOM & GUEST ROOM! The Southern & Eastern views featuring miles of open river, downtown & the bridges are among the best in the building- and this community offers some of the best views in the County!!! One of the only condos able to boast complete privacy- no neighbors can see you (& you can’t see them!) Completely updated! This unit comes FULLY LOADED, TURN-KEY- bring a toothbrush and move in!!! 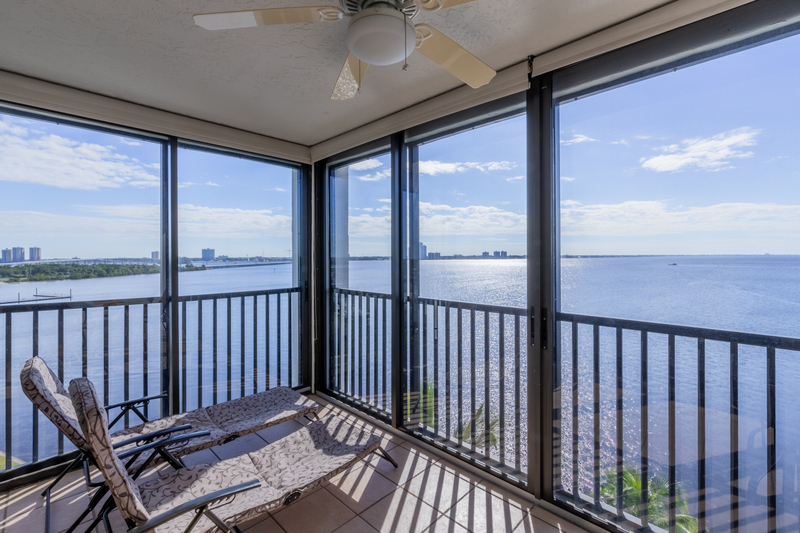 You will enjoy waking up in the morning to sunrises over downtown Ft Myers and fall in love with the amazing, unrivaled views- you literally have miles of river- to gaze at. Located in North Shore Place, an immaculately maintained 2 building condo community, located on the North Shore of the Caloosahatchee River, offering a fantastic pool, hot tub & grill overlooking the river, tennis courts, remodeled & fully equipped exercise room w/ a sauna, lighted dock w/ seating, community room, bike storage, covered parking & storage sheds. Marina Town is a short walk & offers several waterfront bars & restaurants. $391/mo HOA fee includes water! Don’t Delay! You don’t want to miss these views, or this opportunity to buy in paradise.